When Mirror Online asked if I had any ideas for articles based on the colder weather, I wrote about cheap and cheerful winter warming soups. I think soup is a fantastic option when the temperature plummets and the nights draw in – comforting, filling, easy to cook and virtuous if you pack in the veg. You can read the finished article here and even vote on your favourite. I chose three soups that I make regularly, carrot & coriander, bacon & lentil and butternut squash & pepper, then added a super speedy version of minestrone as a filling option packed with pasta and beans. I ended up having to cook all of them in the days before writing the article, to double check the quantities and hence the price per bowl. – Trying to multitask cooking soup first thing in the morning while getting the children ready for school was not my best plan. Think the highlight was hurling a tin of chopped tomatoes into a sieve, rather than the tin of beans I meant to rinse, and watching most of the tomato juice disappear down the sink. Sigh. Good thing I had a spare tin. – Pretty much all my favourite soups are orange. There was I thinking the recipes were quite varied, but turns out carrots, butternut squash, red peppers and red lentils all end up pretty much the same colour when cooked. Normally, this is not a problem, because I’m more interested in eating them than looking at them. However, faced with the prospect of taking photos to illustrate an article, it became more of an issue. I only realised half way through, and had to resort to using different backgrounds and chucking chopped coriander on top to make them look vaguely different. – My food photography leaves something to be desired. 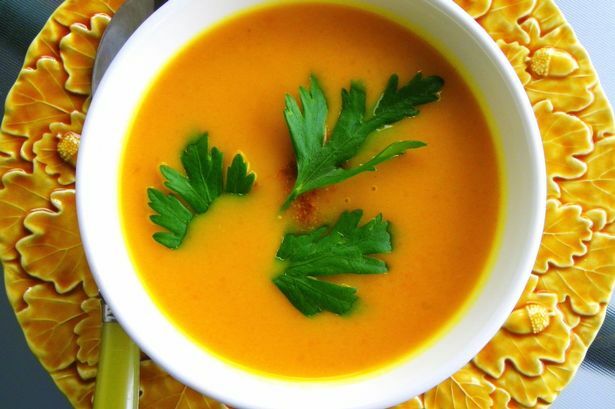 See the lovely picture of carrot and coriander soup at the top of the article, with elegant coriander leaves on top, artistic plate underneath and bone handled cutlery? Nothing to do with me. You see the photo lower down, the one that’s a bit out of focus, with an unappetising bunch of chopped greenery on top? That would be mine. It did taste good though, honestly. Glamorous stunt soup, selected by the Mirror. My soup, untouched by the hand of food stylists (or in fact style). So who likes soup when the weather turns wintery? And which soups are your favourites? I do like soup, but I'm far too lazy to make it myself. I buy a tin of Amy's or good old trusty Heinz. :O) Yours looks rather lovely, even if it hadn't been touched up by food stylists! I haven't tried bacon in lentil soup before- I must try it very soon! The bacon does add a certain something, and helped persuade my husband to brave lentil soup. Nice article, I'm going to try the storecupboard minestrone soup! I like your photo, good nourishing soup and just like I would have in my dish any day of the week. The top 'stunt' shot is all style over substance, well until you fish out the giant leaves and actually get down to eating the brightly coloured loveliness anyway.